Next Monday, two county supervisors will call into question the 12 principles that have been guiding the county’s general plan update since March 2004. In an email to Planning Director Kevin Hamblin sent yesterday evening, 2nd District Supervisor Estelle Fennell offered a draft of 11 rewritten guiding principles. She explained that she’s “been hearing from several people” about the existing principles and that both she and 5th 1st District Supervisor Rex Bohn would like to see her alternative versions discussed. How do Fennell’s guiding principles differ from the existing ones? They put a stronger emphasis on property rights and rural development and deemphasize environmental protections. 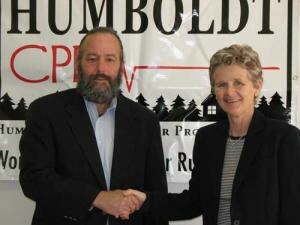 This shouldn’t come as a surprise given Fennell’s almost three-year tenure as executive director of private property rights group Humboldt Coalition for Property Rights (HumCPR) and her recent votes to appoint that group’s leaders, Lee Ulansey and Bob Morris, to the county planning commission. Let’s do a little compare and contrast. Gone are protections for agriculture and timberlands, replaced by incentives to produce on those lands. •	Existing principle: “Provide sufficient developable land, encourage development of affordable housing for all income levels, and prevent housing scarcity under a range of population growth scenarios. These two may seem similar, but the differences are meaningful. The existing principle is geared toward maintaining an adequate housing inventory. Fennell’s version takes for granted a decline in affordable housing, and calls on the county to actively “promote and facilitate” new opportunities. Since the general plan update is a planning document intended to last for 20 years or more it makes little sense to base policy on a variable market assessment, especially one that may already be incorrect. According to the latest data from the Humboldt Economic Index, home sales have increased by more than 15 percent in the past year while prices have dropped dramatically. This change comes straight out of HumCPR newsletters. Fennell’s suggestion would eliminate the goal of focusing development around existing services and instead open up the county’s rural lands to development, in part by allowing non-standard waste management systems. Here Fennell explicitly places landowner rights ahead of environmental protections, which she would leave to “a balanced approach.” She doesn’t specify whose definition of balance would be applied. Opinions in this county vary wildly about how best to balance the two opposing values. Replacing “preserve” with “honor” implies reverence. To what? You decide. Here Fennell shows a libertarian’s distrust of government, denying the county’s authority to develop a strategy for economic development. Such development is a goal unto itself, says Fennell. Fennell would eliminate the requirement that projects be consistent with the general plan, which raises the question: Why have a general plan at all? •	Fennell’s version: None. This one’s simply deleted. If you'd care to discuss these dramatic revisions to the principles guiding our county constitution, you'd better hope you can take Monday off work. The hearing starts at 1:30 p.m. in the supervisors' chambers at the county courthouse.